Republicans across Ireland marked the anniversary of the death in 1981 after 46 days on hunger strike of IRA Volunteer Martin Hurson. Aswell as in Hurson's native county of Tyrone, the 25th anniversary was marked by events on 13 July, the anniversary of his death, and over the weekend in Dublin, Belfast, Longford, Derry, Cork, Louth, Cavan and Down. 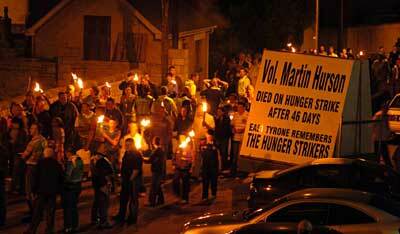 Speaking in advance Dublin Councillor Larry O'Toole said: "Martin Hurson was from Cappagh in East Tyrone. He was just 24 years of age when he died on 13 July after 46 days on Hunger Strike. He was a candidate in Longford/Westmeath in the 1981 General Election and received massive support from the people of those counties. "The events of 1981 were a watershed moment and the sacrifices made by the men in Long Kesh and the women in Armagh Jail remain with us to this day. I would encourage Dubliners to get involved in the events in Dublin tomorrow and indeed throughout the year as we seek to remember the Hunger Strikers who died in 1981 and build the sort of Ireland which is peaceful, free, united and democratic. The Community of Galbally and Cappagh in East Tyrone certainly rose to the occasion when it came to organising a fitting commemoration for local Hunger Striker, Martin Hurson on the 25th Anniversary of his death. Perhaps, Ken Loach should make a film about East Tyrone. They certainly shook the barley in this part of the country. What happened in the rural community of Galbally and Cappagh last weekend will live long in the memory of everyone who witnessed the incredible outpouring of support for Martin Hurson and his comrades 25 years on. On Thursday evening, 13 July, over 800 people listened intently to Martin's family, friends and comrades. They told Martin's story from the horse's mouth. It was a night to remember. We heard about the beatings at Omagh RUC Barracks, the trial without a jury and the barbarity of the prison regimes in Long Kesh and Armagh. We heard about Martin's sense of humour and about 'The Hurson Boy's' tendency towards mischief and how he and Bernadette Donnelly struck up a close relationship. Brendan Hurson is economical with his words but in Tyrone, they hang on his every word. The double decker bus used to shuttle those taking part from location to location would have suited Dublin City centre better than the meandering country roads and hills of Tyrone but it was a great idea. Everything was carried off with military precision, as you would expect in an unbowed place like this. Earlier that same evening, the people of Ardoyne in North Belfast showed their solidarity by hosting a Galbally Football Select and by unveiling a mural in honour of the Hunger Strikers. Ardoyne is another place where they shook the barley. The Saturday saw the completion of the Martin Hurson Tournament with Killeeshil Ladies and Cappagh Martyrs winning the day. A packed function took everyone into Sunday morning. And Sunday was the culmination of it all. Again, Croke Park could learn lessons in stewarding from the GAA Club and republicans of East Tyrone. Everyone was involved and every last detail was attended to. With over 2,000 people walking from Galbally this time to Cappagh, it was evident that the life and death of a Hunger Striker has had a most profound effect on a community. No shortage of confidence or pride. At the IRA monument in Cappagh village street, Paul Kelly presided and welcomed Sinn Féin President Gerry Adams who delivered a well received oration tracing the history of the 1980 and 1981 Hunger Strikes and urging people to remain active in the struggle for Irish Freedom. Wreaths were laid by all the relevant organisations and it was particularly poignant that the Martin Hurson Memorial Band and republicans from Longford should step up. Local republicans from Killeeshil, Donaghmore, Pomeroy and other parts of Tyrone also played a huge part in marking this hugely significant anniversary. Family representatives of the other Hunger Strikers were in attendance as no doubt they all will be again when it comes to remembering Kevin Lynch, Kieran Doherty, Thomas McElwee and Michael Devine in the remaining summer months.